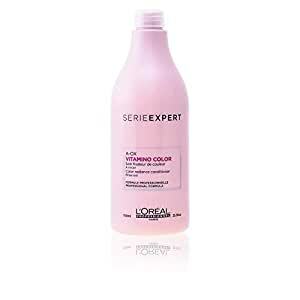 Vitamino color a-ox conditioner weightlessly conditions and prolongs color radiance for color-treated and highlighted hair. the vitamino a-ox complex of antioxidants and uv filters helps withstand elements that fade color & shine. 1.0 out of 5 starsWas not same product! I usually purchase this product through a friend that has a salon never had a problem til I ordered through this seller on Amazon. The product was NOT the same. Very thin and didn't work like the product through salon. I won't order this from this seller again! BUYER BEWARE! My hairdresser uses this brand so I was a little disappointed to find the conditioner basically dissolves once you put it in your hair and doesn't give me that creamy feeling before rinsing it out. I will say however that once it's rinsed out my hair is easy to brush and has held it's color. It could be that I'm just used to those conditioners that feel thick and creamy when left in your hair. I probably would still buy this again because I know what to expect now. I love this conditioner which would have cost me 4x the price in stores. L'Oréal Professionals is very close to the more expensive Kerastase. I loved this product, the price. Definitely will buy again! 1.0 out of 5 starsNot real... don't buy! 1.0 out of 5 starsDon’t buy from this vendor!!! I’ve used this conditioner for a long time, and the bottle sold through this vendor is either old or tampered with, because it’s very watered down and barely works. Bad!! !